In this book, we look at the ways in which these resilient people took their grief and remolded it, bringing new meaning into their lives. They mourned, and continue to do so in various ways, but also carried on as an affirmation of life’s preciousness and the heart’s capacity for renewal. Project Rebirth is ultimately a book about the power of the human spirit to rebuild itself— within and among community. Those who lost loved ones in the World Trade towers or barely escaped from the wreckage themselves had their lives instantaneously devastated. Who they were on September 10, 2001— how they spent each day, how they saw the world, what they expected from the future— was entirely dismantled. They were put in the unenviable position of reconstructing their very lives. And therein lies the miracle. They did it. They took the most malicious misfortune imaginable and transformed it—tear by tear, day by day, dawn by dawn. They are not alone. It wasn’t just those directly affected by the events of September 11 who felt their lives forever change. We all got a taste of destabilization. Further still, even if in a drastically different context, we all mourn. We hope that in these courageous stories you will find echoes of your own experiences of loss and recovery. We hope that this book will serve as comfort amid discomfort, these words as reconnection to hope, these flawed and fierce examples as a reminder of the universal human capacity for resilience. In a world in which so many of our days are filled with the minutiae of existence— the cable bill, the carpool schedule, the bureaucracy at work, at school, at the doctor’s office— it’s more important than ever that we take a moment to focus on the most essential elements of our existence. At a time when 140 characters and thirty- second sound bites have become our dominant forms of communication, this book offers the depth that comes from decade0-long stories and painstaking reflection. Tragedy like the kind faced by the people profiled in this book forces that quality of focus. It inspires us to ask the most basic questions that we face as human beings: What is my life about? What’s important? How can I use my energy for good? Have I loved well? What is my legacy? What’s more, it compels us to not settle for the easy answers. Instead, we honor the complexity of our lives and losses by stepping away from the cacophony of modern life and really listening to the wisdom in these long- developing stories. If these survivors’ struggles teach us anything, it is that we all have an opportunity to ask these questions of ourselves on a regular basis. Trauma and loss may be our most profound motivators, but we don’t need to wait on them to start seeking out our true path or valuing the people we love. Ultimately, the biggest tribute to the survivors featured in this book is not the anniversary ceremonies that occur each September 11, beautiful as they may be. It’s not feeling sorry for them or dramatizing their very real loss. The ultimate tribute to the survivors of September 11, 2001, is bearing witness to the stories of their recovery, and incorporating some of their wisdom into our own lives— today. It is recognizing how wildly precious and fleeting our lives are, that we have no other viable choice, really, but to make them as courageous and loving as possible. The above is an excerpt from PROJECT REBIRTH © Dr. Robin Stern and Courtney E. Martin. Published by Dutton, A Member of Penguin Group (USA) Inc. Excerpted with permission from the publisher. All Rights Reserved. Written in conjunction with the documentary Rebirth, a full decade in the making, an uplifting look at the lives of nine individuals whose lives were forever changed by the largest tragedy our nation has ever faced. 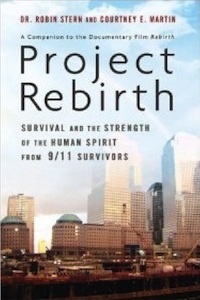 In Project Rebirth, a psychologist and a journalist examine the lives of eight people who were directly affected by the events of September 11, 2001. Written concurrently with the filming of a forthcoming documentary, it is uniquely positioned to tackle the questions raised about how people react in the face of crippling grief, how you maintain hope for a future when your life as you knew it is destroyed, and the amazing ability of humans to focus on the positive aspects of day-to-day living in the face of tragedy. Not a book that recounts the events of that day, and not a book about grief, Project Rebirth is a book about resilience and finding inner peace. Dr. Robin Stern is a psychoanalyst, educator, and author. She is one of the lead facilitators for the Inner Resilience Program, created post- September 11 to help educators build resilience and coping skills, and she lives in New York City.